Fitxategi:BullExurgeDomine.jpg - Wikipedia, entziklopedia askea. 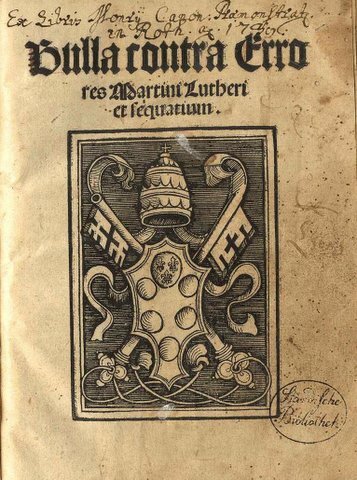 Image of the title page of Pope Leo X's Bull, Exurge Domine , threatening to excommunicate Martin Luther, scanned from a first edition copy in the library of Concordia Theological Seminary by Robert E. Smith. Illustration shows papal version of Medici coat of arms.